Frankly My Dear, I Don't Give a Damn! Or, maybe I do.. The first is that I have severe handicap in the floral world. Don't get me wrong, I love flowers, all shapes, sizes and colors. But, when it came time to describing what I am looking for to our florist, I basically spoke the language of moosh. I brought my pictures of inspiration, but when it came time to elaborate on my "liking a little of this, with a little of that," I think I made his head spin. Apparently the adjectives big and fluffy aren't the best choices when you are talking about flowers you like. The second thing I learned is that my fiance actually does have opinions about the wedding! Who knew?! His perpetual answers of "I don't care, you have great taste," or "that looks good," had me convinced that this was my show to plan. Nope. Sit him down with the caterer and wedding planner, and a party planner emerges. He had all kinds of ideas on where things should go, how things should be laid out, even how the flow of the night should run. It was great, having him engaged in the process, though a bit strange since I was used to having all the answers. Not to mention that he has zero clue about the cost of things, and the way he was planning, we would have ended up with a six figure wedding! But apparently this side of him only exists on the island since back in the reality of everyday, I get the follow up email from the caterer. I bring it to him to discuss, looking for the advice of my party planner extraordinare, but baseball was on, and with a glance at one of the four pages, came the "that looks good." Go figure. So, today is officially four months to our wedding day, and coincidentally, we are getting ready to pack up and head down to Amelia Island. It's just a long weekend getaway to meet with our planner, and start nailing down some of the details. It promises to be a fun few days, filled with lots of decision making, which I look forward to sharing when we get back! I have recently been inspired by various types of guest book ideas I have seen, one of them being from a real wedding that was recently featured on Snippet and Ink. 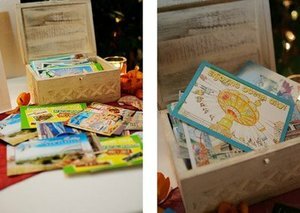 The couple got married in Ocean City, NJ and in lieu of a traditional guest book, had their guests write notes on Ocean City postcards. 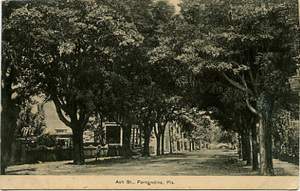 After the wedding, the wedding coordinator sent the postcards to their home in Washington, DC. I absolutely LOVE this idea! Given that we are doing the destination wedding, I can't think of a better return home, then to find all those postcards from friends and family in your mailbox! Plus, I am excited at the idea of putting them in a scrapbook of some kind, so that I can look back on them through the years. 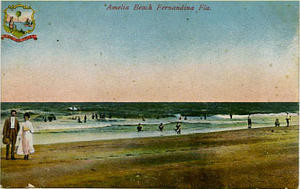 I did a search, and was able to find some postcards of Amelia Island, with pictures taken from the turn of the century. Aren't they neat?! I love the classic feel of them. We are headed down there at the end of next week, so I plan on doing some digging and coming up with more. I'll keep ya' posted.. I have been thinking a lot recently of fun ways to make our wedding unique, other than decor, location, etc. One thing I thought of, that I loved, was how a girlfriend of mine designed a guestbook by having Polaroid cameras at the wedding for guests to take pictures with, then create a page, with a note to the bride and groom, and putting it together in an album. I thought about taking that idea to next level, and instead of Polaroid cameras, why don't we rent a photo booth?! I found this company, Plumb Fun Photobooths, who lucky for me, are located in Jacksonville, FL. They provide the rented photo booth for four+ hours, include an employee to help run it, and allow you to customize the backdrop for your event! I think it would be so fun to not only have a book put together with the images of our guests, but also for our guests to be able to take home strips of pictures for themselves! 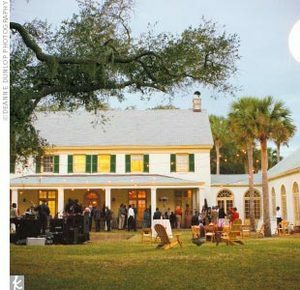 Since I know that not everyone is getting married around the Jacksonville area, you can easily go to America's Photobooth Association and search out your location to find a vendor near you. I thought it fitting that I fill in a few blanks regarding my upcoming wedding on October 25th of this year. My fiance and I are from Philadelphia, and love our home town, but when it came time to planning our wedding, we had one word in mind, DESTINATION! We began to search out potential sites, until one afternoon I stumbled upon a real wedding on The Knot that took my breath away. I saw these pictures, and I knew that this was what we were looking for! 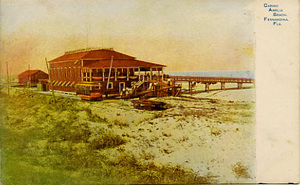 It is the The Ribault Club, which is located on Fort George Island, FL. 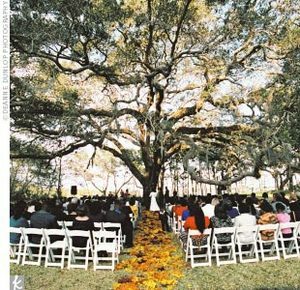 I knew that when I saw that big oak tree, we had to get married underneath it. 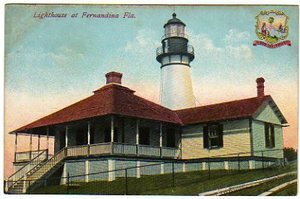 Upon further research, I found out that Ft George Island is one of the barrier islands, and is right next door to Amelia Island, a gorgeous vacation spot about a half hour from Jacksonville, in northern Florida. It was perfect! 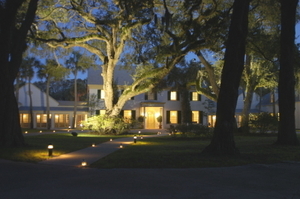 We wanted a destination wedding, it will be an easy locale for our guests to get to, and presents a southern charm that will give our special day something completely beautiful and unique! I contacted Leana Gallagher, who runs Amelia Occasions, and put the wedding planning in process. She is awesome, and I have definitely needed her help, given that I am not only planning a destination wedding, but a destination wedding at a venue where all the vendors have to be brought in! So many decisions, so much to do, but loving every minute of it!